There are a number of ways to make files on one PC available on another. There's cloud-based software such as Dropbox, which uploads files in a special server onto the internet, then downloads them onto another computer. Any new files, and any changes you've made to the files, are then mirrored across the internet. There are also hardware options, such as having a network storage device (NAS) that is essentially an external hard drive that is connected to the internet. Your PC uses it as it would a normal hard drive, but you can access the files you store on it from any internet connected PC. The iTwin takes a different approach. 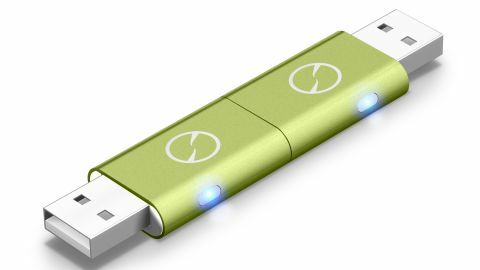 At first glance it appears to be a double sided USB drive, but it's slightly more advanced than that. You begin by plugging one end into your PC. While plugged in, the iTwin software needs to be installed. After that you can access the 'iTwin Local Files' as if it was an installed drive on your PC, dragging and dropping files that you want to access on another PC. Then comes the interesting bit - you detach one half of the iTwin and plug it into another PC. Once the iTwin software is installed, you can see all the files you've added to the 'iTwin Local Files' folder on the other PC. You can then drag files from the iTwin onto your other PC, and copy files from the new PC onto the iTwin. Any changes are then replicated on the original PC. It's a fast, easy and intuitive process that works really well. A nice touch is that if you delete a file from the iTwin, on the original PC you are notified, so you can prevent it from being lost. There's added security as well, since only the two parts of the iTwin that are paired with each other can see the files. The combination of physical protection along with the simplicity of the software makes the iTwin an excellent device for syncing files and folders between PCs.